The Federal Trade Commission requires that I inform you that this post contains affiliate links. That means I receive a small commission if you make a purchase using these links. For a complete explanation, please read my full disclosure. I write a lot – it’s my day job. And I read a lot. Consequently, I read quite a bit about sailing and sailboat restoration. I’ve learned a lot of what I know from reading and then backing it up with my own real-world experience. Sharing those experiences is at the core of this blog. In my book (pun intended), book knowledge alone isn’t worth the paper its printed on. Like they say, that and $4 will get you a cup of coffee at Starbucks. But discovering the hard-won wisdom of others who have gone the same way before us and applying it in our own lives is just plain smart. There are times to pave your own way but more often than not, following in someone else’s footsteps is a lot easier. When it comes to sailing and working on my sailboat, I’m not very interested in being a pioneer. I just want to have fun with it. Enough philosophizing. Starting with this post, I’m going to introduce a new type of post on this blog – book reviews. I’ve read some great books in which I’ve learned some good stuff and I’d like to pass on my impressions and recommendations to you. I hope you enjoy these reviews and they help you discover new ways (and old) to enjoy sailing and your sailboat more. Besides, it’s winter right now around here and there’s not a lot to do on our boats. This is a good time to read up on how we can improve our skills for next summer. That is, unless you live in the southern hemisphere where it’s prime season. G’day! to my Aussie readers. I also want you to know that these reviews are the real deal. I won’t review any book that I haven’t personally purchased and read myself. I promise to be honest and tell you the bad and the good about each one and let you decide for yourself. Many of them will be directly related to DIY and sailboat restoration and improvements, but I might throw in an occasional exception that I think is also worth reading on its own merits. Everybody on the Internet is a critic these days, it seems. What makes me any different? I’ll give you a bit about my background, for what it’s worth. I’ve written professionally for many years and I’ve edited other authors. I was once a regular contributor to a major trade magazine, writing cover articles. My own books (not about sailboats) were on the shelves at Barnes & Noble years ago and you can find them on Amazon if you know what to look for. My magnum opus is now ranked #8,710,503. Impressive, huh? That and $5 will get me a latte at Starbucks. I say all that not to toot my own horn (well, maybe a little) but because I believe I’m qualified to write these reviews. I know what it takes to make a good book, so I’m asking you to trust my reviews. 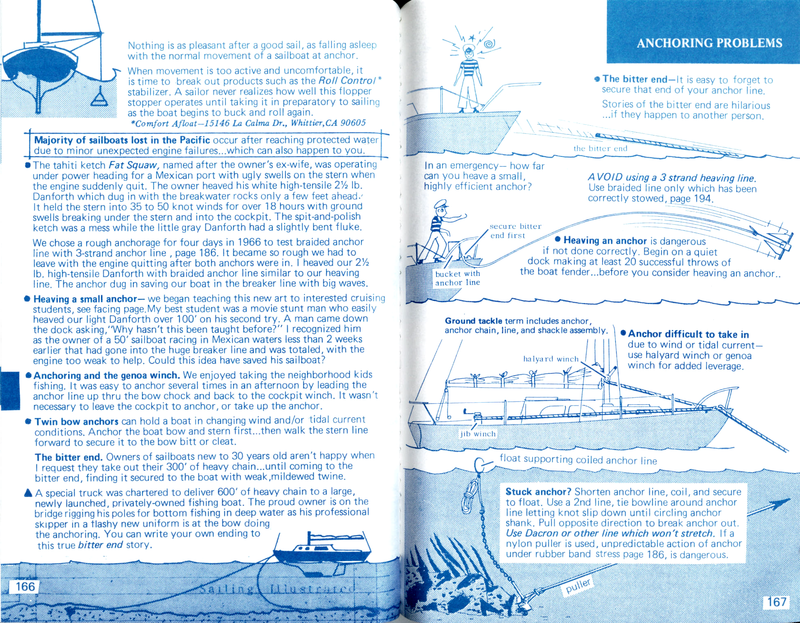 Talk to long-time sailors (stingy or otherwise) for very long about how to rig a sailboat or the easiest books to learn sailing from and one of them will recommend that you get a copy of Royce’s Sailing Illustrated, Volume 1: Tall Ship Edition. This is the first book that I bought when I started sailing and it was the perfect choice. 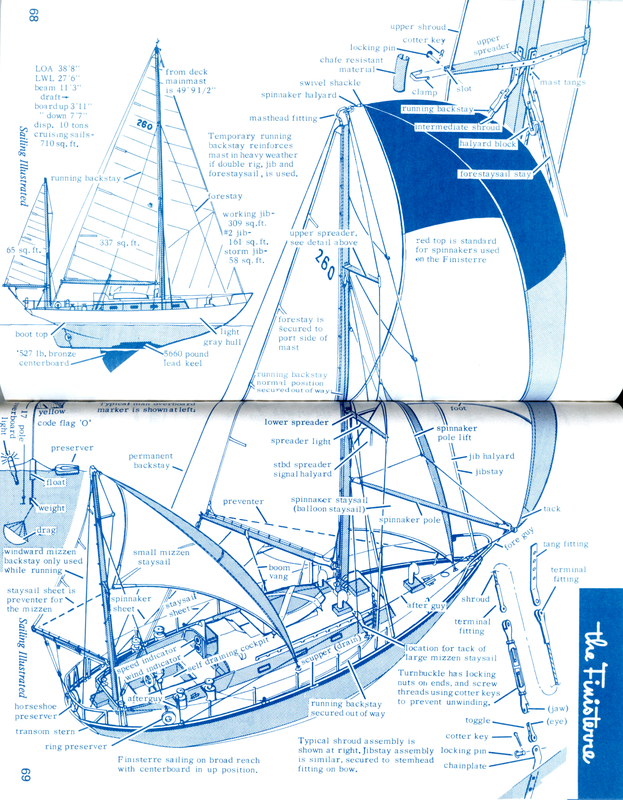 In a nutshell, it’s a handy little paperback that condenses most everything that you need to know about sailing into a handbook with lots and lots of hand-drawn illustrations by the author himself. It’s cover claims it is “the best of ALL sailing worlds”, “the most recommended sailing reference ashore and afloat”, and “the sailor’s bible since ’56.” You’d be hard pressed to refute those claims. What’s the book got to do with this blog? If you have any trouble figuring out what some of my rigging posts are about, this book will draw it out for you, literally. First published in 1956, the text is mostly bullet lists of nuggets of practical information that you can use right away. This isn’t a book designed for you to sit down and read cover to cover, although you can do that. It’s not an encyclopedia of sailing (I will post a review of that book later), it’s the Readers Digest version. This is a book that you can turn to when you need to quickly learn (or remember) how to do something. Along the left side of the back cover is an index to the sections of the book that are marked with tabs printed in the outer margins. Need to remember how to jibe a spinnaker? Just open the book to the corresponding tab and there it is presented in a way that you can absorb in a minute or less. Think of it as Google with only one answer to read. Most topics are covered in one page or two facing pages, for example, anchoring problems below. But it’s also more than that. Sprinkled throughout the 368 pages of facts and pictures are some of author Pat Royce’s own experiences and advise written in to-the-point language that most readers will find easy to understand. If you had a dad or grandad teach you how to sail, he might have sounded like Pat. But what really sets this book uniquely apart from all others are the hundreds of detailed illustrations about everything from how to roll a mainsail to tall ship rigging. As a former draftsman, I really appreciate Pat’s drawings. He makes the maximum use of space and his sense of scale, perspective, shading, and line weights are excellent. Who draws like that anymore? Worth the price for its artistic value alone. Practically anything that can be explained with a picture is accompanied by one or more of his well-annotated drawings. This book is the poster child for the saying, “A picture is worth a thousand words.” This book took a LONG time to produce, five years according to the introduction. If you learn things easiest visually instead of verbally, this is the book for you. Now for the down sides. There aren’t many but they are quite noticeable. Most readers will be able to forgive them, considering the book’s long history. The typesetting is crude and inconsistent in places when compared to today’s publishing standards, to the point where it looks like it was added with a typewriter. Combined with the graphics splattered on the pages, that can make it a little rough to read and follow. Fortunately, since the text is bite-sized chunks anyway, it’s not a big problem. For this, you have to understand that the book was laid out long before personal computers, word processors, and digital publishing. The many hand-drawn pictures and their annotations make it virtually impossible to bring them into the digital age unless they were all completely redrawn on a computer. But that would destroy the book’s personality. The overall design makes the book look outdated and obsolete when, in fact, it has been revised and updated nine times to include most major technological improvements. Once I got familiar with its friendly style, though, I found it to be honest, humble, and even a bit entertaining. Too many pages are devoted to tall ships, square rigs, and historical Naval warships for my taste. They seem out of place in a how-to sailing book. If you’re a history buff, you’ll appreciate how they round out the full context of sailing, hence the tagline “the best of ALL sailing worlds.” Other than out of random curiosity, though, I’m not much interested in learning what a futtock shroud does. If you consider yourself a novice sailor, Royce’s Sailing Illustrated Volume 1: Tall Ship Edition is a great information tool to quickly fill in the gaps in your knowledge base and to keep onboard for the unexpected. If you’re an experienced sailor, it makes an excellent gift for that son, daughter, or grandchild that you want to pass along your love of sailing to. Younger readers will enjoy browsing the pictures and learn without realizing it. In case you’re wondering what Volume 2 is about, it’s the expanded, classroom instruction counterpart to the handbook. A picture-oriented workbook and a corresponding Instructor’s Manual are also available. Want to buy your own copy of this book on Amazon and support this blog without paying any extra? Royce illustration of throwing out the anchor is not acceptable. I have experienced the flaw in throwing in anchor out and also saw an underwater video of what happens when an anchor is thrown it out. As the anchor tumbles in the water, the line can snag around the flukes and you will never be able to grab into the ground. I have Royce’s smaller book on sailing dinghies which is just as delightful as this larger book. Thank you for the wonderful review and letting me know that there is a larger book available. I’d agree that throwing the anchor is one of the first steps to guaranteeing problems setting the anchor. Few people can throw one far enough to make a difference and it has to be done right to be effective and safe. The only time I do it is when in shallow water to increase my scope a little and the odds of the rode fouling in the flukes on the way down are lowest. I try to keep slack out of the rode until it hits bottom or even pull slightly just before it hits to be sure its pointing the right direction. All other times, I just drop it. Do you have a link that includes your referrer code, for the book on amazon.ca ? I do not, sorry. The Amazon site for each country operates under its own program. Based on the number of purchases made on amazon.com from the US and the fraction of all readers that are from Canada (although many and I appreciate them all), purchases from Canada would probably not be sufficient to maintain my membership in the Canadian program. At least not at present. If blog readership continues to grow like it has, I might reconsider it in the future. Thank you for asking! I really appreciate my readers who take advantage of my affiliate links. It doesn’t produce much of a commission yet, but it’s helping to pay my out-of-pocket costs of running the blog. So, I actually came to this site to write a review of the book I just bought from you. Your rigging book is really excellent. Now that I read more of who you are I understand why the writing is so very well presented, you’ve done an excellent job. Now as to ol’ Pat and his s/v Pink Cloud, please everyone note that he threw out a 5 pound Danforth anchor in the San Diego area when sailing. Mr.Royce was a huge guy. I took a lesson from him in 1968. He’d pitch that 5# Danforth like a bloody horseshoe! About the tall ships, he just loved to draw tall ships! There are MANY editions prior to and later on that were all about dinghys, daysailors, trailerables, all the way up to s/v Finisterre. I remember he adored that beautiful yacht. It was moored near him in San Diego Bay. So, there are many. I own edition numbers 1, 3, 6, & 8. Further, Ken is right. One must consider the time period, 1956 till, I reckon, 1978 or so. He and his bride taught sailing mostly at and out of the San Diego marina. He further mentions in most of his semiannual revisions that this is a “lunch hook.” So anyway, the guy lived, breathed, an prolly pooped sailing since, I think he said, the 1940s?? s.v. Spirit, uscg31275012 OUT. Channel clear.